I may lack knowledge of football, but I do know what I like in a crab cake (and a good segue): just the right crab-to-breading ratio; crispy outer layer; nice crab flavor (no fishy taste); and seasoning reminiscent of a crab or crawfish boil. The most perfect crab cake I’ve ever had can be found, strangely enough, at a little family-owned Italian restaurant in Altoona, PA called Lena’s. Our prior attempts to recreate the Lena’s crab cake at home have been largely unsuccessful. We decided to give it another shot for the Steeler Opponent-City Challenge this week, since Baltimore and the entire state of Maryland are known for crab, especially blue crab. We weren’t able to find blue crab, but we bought the best (most expensive) fresh crab we could find, adapted this recipe, and ended up with crab cakes almost as good as the perfect ones we get from Lena’s. 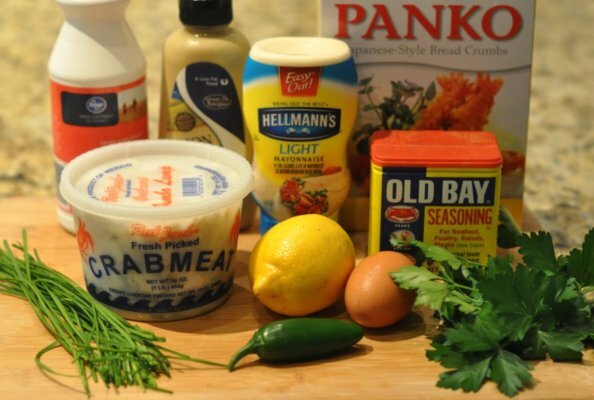 Using panko instead of traditional breadcrumbs helps keep the breading light, while the flavor combination of Dijon mustard, Old Bay Seasoning, lemon juice, parsley, jalapeno and chives complements the crab flavor really well. Crab cakes so good that you don’t even need cocktail sauce equals a win in our book. Unfortunately, the Steelers weren’t so lucky against the Ravens, which brings the current S.O.C.C. record to: Steelers 6-4, Foodie Lawyer 9-1. And watch out Ravens — you beat us once this season, prepare to lose when we play you again in two weeks. Soaking the crab in milk for about 20 minutes will reduce any fishy flavor. Drain the crab well after it soaks. Finely chop the chives, jalapeno (remove the seeds first) and parsley, and measure out a couple teaspoons of lemon juice. Lightly beat an egg in a large bowl. Add the chopped parsley, chives and jalapeno, lemon juice, Dijon mustard, mayonnaise, and Old Bay seasoning to the egg and mix it all together. Use a spatula to gently fold in the crab, panko and salt & pepper to the egg mixture. Use your hands to form 4-6 crab cake patties of uniform size. Place the crab cakes on a tray or plate and refrigerate for about 2 hours. Coat each crab cake with a layer of panko. Heat a couple tablespoons of vegetable or canola oil in a large non-stick skillet over medium-high heat, place the crab cakes in the skillet and cook, turning the crab cakes over once, until golden brown on both sides — about 3-4 minutes per side. Our crab cakes stayed together pretty well, but be careful when you flip them over so they don’t fall apart. We served the crab cakes with homemade cocktail sauce (that we barely used, since the crab cakes were so good on their own, with just a squeeze of lemon) and a bib lettuce salad. (And a side of Steeler earrings. Clearly we are running out of Steeler paraphernalia to include in the photos. Don’t worry, the earrings and the food never touched each other.) As a Steeler fan, I will do my best to harbor the rivalry and dislike Baltimore’s Ravens, but I can’t say the same for their crab cakes. Soak the crab in milk in a small bowl for about 20 minutes. Drain the crab well after soaking it. Lightly beat the egg in a large bowl. Add the mayonnaise, Dijon, lemon juice, Old Bay seasoning, parsley, jalapeno and chives to the egg and mix everything together. Use a spatula to gently fold in the crab, ¾ cup of panko, salt & pepper to the egg mixture. Form the crab mixture into 4-6 patties of uniform size, place the crab cakes on a tray or plate and refrigerate for 2 hours. Place the remaining ½ cup panko on a plate and coat each crab cake with a thin layer of panko. Heat the oil in a large, non-stick skillet over medium-high heat. Place the crab cakes in the skillet and cook, gently turning the cakes over once, until golden brown on both sides — about 3-4 minutes per side. Serve with lemon wedges and cocktail sauce.